If you’re a student of what Leonard Cohen referred to as the ‘holy game of poker’ then it’s always useful to know where and how this popular gambling pastime originated. For many years the thoughts of Robert Frederick Foster led the way and in the 1937 edition of Foster’s Complete Hoyle he made it absolutely clear that poker derived from a Persian game called As Nas. As Nas certainly seems to have seem resemblance to modern poker variants and it does involve betting but late in the 20th century Foster’s assertion was challenged. Other games such as the French ‘poque’, itself descended from the the German ‘pochen’, along with the English game ‘brag’ (descended from the French ‘brelan’) have been named as possible influences on the modern game of poker. However, others believe that poker is a unique game, developed in the Mississippi River region in the 18th century; poker betting is unique, without any apparent ancestry and perhaps poker historians are looking for a link which isn’t there. Rules were variable in the deep south in the early days; 20 cards were sometimes used when there were just two players but 52 card versions of stud and straight poker are certainly documented. The famous Mississippi riverboats transported the game beyond that state and further north, aided by the passage of frontiersmen and gold rush participants. 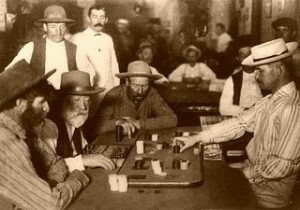 The 19th century saw a proliferation of new versions of the game but it wasn’t until the 1920s that community cards were introduced, although a place called Robstown in Texas claims to have been the birthplace of Texas Hold’em around the turn of the 2oth century. Poker is now a wildly popular casino game with millions of players around the world taking part online and offline in countless tournaments and cash games. It’s an unexpectedly popular television event, partly to do with the introduction of the hole card camera, meaning that the viewers can see each player’s cards.